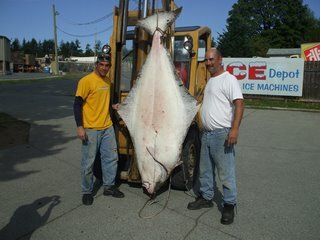 Randy Ruttan and Kirk Dodsan caught a 323 pound halibut on Sept.8th...here they are with their fish of a lifetime....caught near Sooke! Certainly the biggest halibut of the year caught near Sooke, and possibly one of the largest ever caught by a recreational fisherman in the area. Now that's a LOT of fish and chips!